Suddenly the Bee is a full on reader! 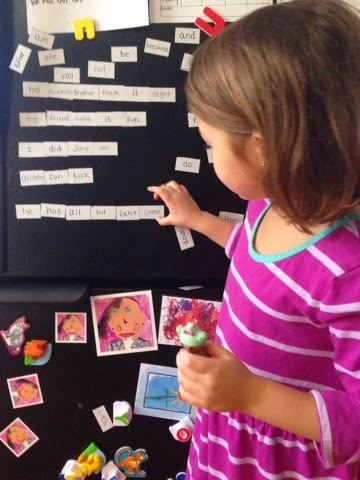 She has been able to read for a little over a year, sounding out letters and reading short books but in the last few months she has become fluent. Reading everything, everywhere all the time. It still sometimes catches me off guard when we are out somewhere and she will ask me a questions about a sign she just read. 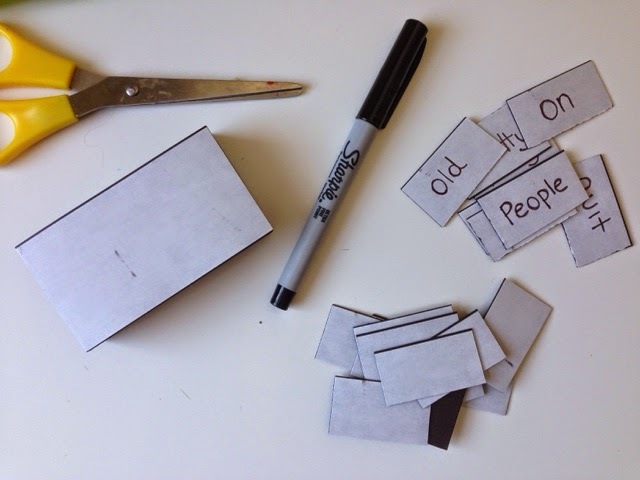 With the Bean not far behind this seemed like a good time to make something which has been on my to make list for a long time, a magnetic poetry set. I am sure I saw this idea somewhere but honestly have been thinking about it so long I can't remember where I saw it. 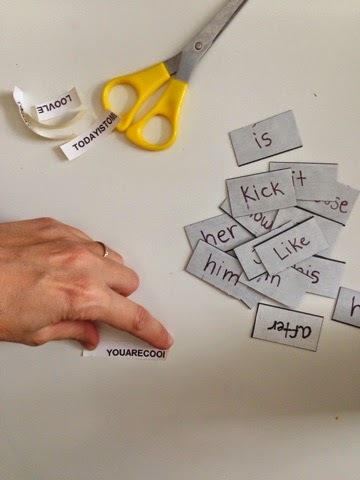 I have seen lots of cool magnetic poetry sets but wanted to make one really geared towards the early readers in my house. So I started by finding a few sight word lists and used these as the basis for our list of words. I also added some of the spelling words the Bee has had this year as well as some family members and other words that are important and meaningful to the girls. Once the list was ready we had a lot of words and were ready to make them into magnets. Coming up with the list of words was probably the hardest part of this project. Actually making the magnets was super simple. I had some magnet strips at our house that probably would have worked fine but now that our little guy is into everything I wanted to make sure the magnets were too big for him to put in his mouth. I found the perfect solution on a trip to Staples, magnetic business cards. They came in a box of 50 and I found that cutting each card into 4 pieces made the perfect size magnet. The cards already had a white paper cover on the front which worked well for writing the words right onto with sharpie. Once I had written all the words onto the magnets we put them on the fridge. So far they have been a huge hit in our house. The Bee can read all the words and likes putting them together to make sentences and stories. 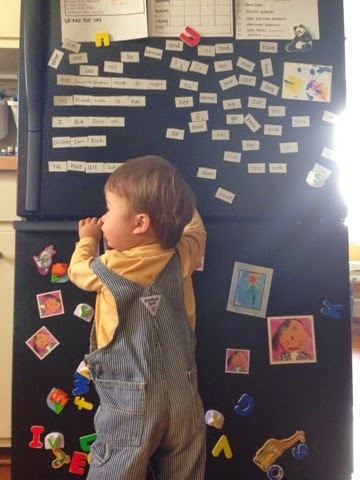 The Bean is starting to recognize a lot of the words and the little guy thinks taking the magnets on and off the fridge is super fun. I am thinking over time we will add more words and maybe swap some out from time to time too. What a great idea! If my new house has an exposed fridge door (not integrated into the units) then I'll definitely have a go at this. Maybe something I can make for my niece too!